rebecca likes nails: I ♥ My Followers GIVEAWAY! 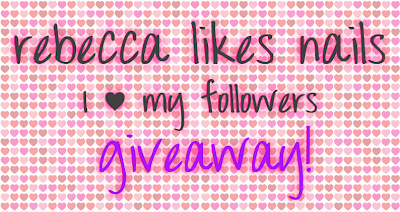 Hello and welcome to my super awesome giveaway for my super awesome followers! I've been wanting to have another giveaway for a while but couldn't figure out the right time or the right prizes. But it has finally come together! A heart-themed giveaway because I ♥ you! There are gonna be three winners! Let's see the prizes! Prize #1 includes a bunch of stuff from yours truly! Heart-themed things and handmade things. - A bottle of Rebecca Likes Cupcakes! This polish is hand made by me with lots of love. - A bottle of Nicole by OPI - Love Your Life. A polish full of hearts! - A Nail Art Diva "From The Heart 1" plate! This heart themed plate is just about the cutest plate ever. Check this mani from my friend Leslie to see just how cute! - Nail polish jewelery, also made by me! A big ring, painted like one of my favorite heart manis! As well as cute little earrings made with Nail-Venturous Floam. I ♥ these so much I had to make a matching pair for myself too. That's a whole lot of awesome, right? Prize #2 is two amazingly beautiful Nfu-Oh polishes, donated by Nail Polish Canada! The blue is #53 and the purple is #51. Holy crap, they are so stunning. I don't own #53 myself but I have a feeling I will need to buy it after seeing it in person, wow! 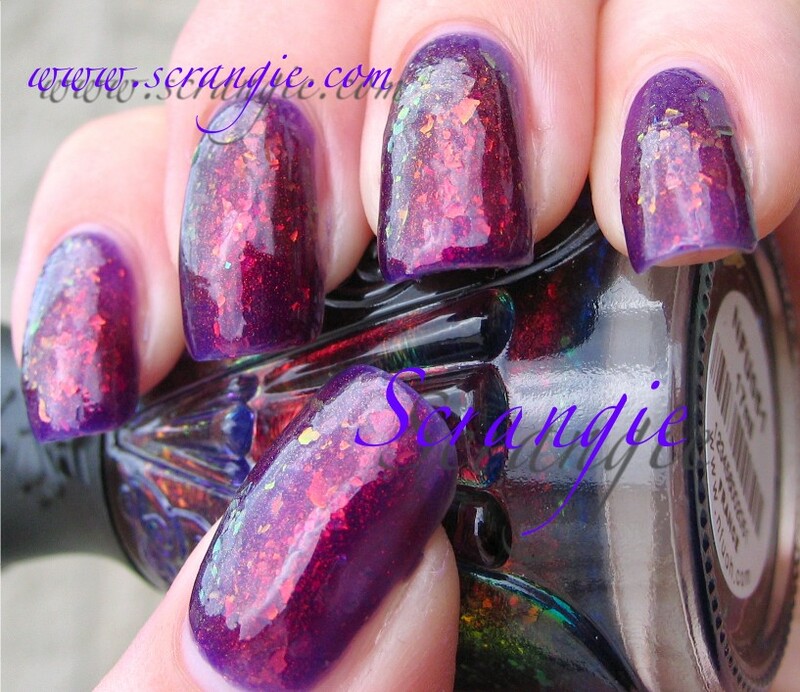 Scrangie has nice swatches of them - click here for 53 and here for 51. Prize #3 is $30 for BornPrettyStore.com! As you probably know, Born Pretty carries just about everything you need for nail art plus much much more. This prize was donated by Born Pretty! Are you guy as excited for these prizes as I am?! This giveaway is open internationally and will close at midnight EST on July 20th, 2012. I will let the first winner choose which prize they would like, and then the second winner can pick from the remaining two, and the final winner gets the last prize. Thanks again to Nail Polish Canada and Born Pretty for their generous prizes! Please use the Rafflecopter widget below to enter the giveaway! Probably number 2....great give away! I would choose prize #1 since it includes a bottle of polish made by YOU! I would LOVE Rebecca Loves Cupcakes! I would love love love to win prize 1! It's so hard to choose which one I'd like to win! But I'd say #1 because you made the polish, earrings, and ring. Prize one! NEED that stamping plate!! OOu all such good prizes!!!! I think I'd love prize 2 or 3, I would love a bottle of Rebecca Likes Cupcakes, though..
All three are awesome, I can't decide! Prize #1 of course! Pure cuteness! I would love to try the Nfu-Oh polishes! I would loooooove to win prize #1, because I wanted that plate this last valentine's day to do a mani, but couldn't find it anywhere. My second choice would def be #3, because I would love to buy some nail art tools :). I would be happy with any of these prizes, but #3 is at the top of my list as there is a ton of stuff on my wl from born pretty. Thank you Rebecca!!!! Awesome giveaway. Greetings from Poland!!! Whatever the prize is, I would be happy:) I'd like to have prize #1. No, #2. No, #3:) What a dilemma:) No. 1 or no. 3. I'd love prize 1, but would be happy with any!! I'd love prize number one because I think Rebecca Likes Cupcakes is too cute!! Super hard choice but gun to head I'd go with one. I think I would pick prize 1...your franken is so cute and I love the jewelry! I love them all! But I think the NFu-Oh is my #1 choice!!! I love everything you do! the ring is soo pretty! So hard! Probably prize one because I adore Rebecca Likes Cupcakes and that jewelry is so cute! I'd like prize #2 the most! those flakies are amaaaaazing! Prize 1, definitely! You're so talented, I love all of it! Oh man, I don't even know.. the giftcard? Prize 2, I am in AWE of Nfu-Oh 53. WOW. Love the 1st prize! I have been wanting Rebecca likes Cupcakes for the longest! Thank you!! I like 1 the best just bc it has your polish in it. Runner up is the gift certificate to the born pretty store. Amazing prizes! I would really like Prize #2. I would really like Prize #2.
tnx for this amazing giveaway!!!! I like prize #2 the best. Such a great giveaway! I'd love prize #1, the Rebecca Likes Cupcakes polish is so adorable! what a great giveaway....i would love prize #1 b/c i am starting a collection of stamping plates. Prize 1 is my fave... but I would be lucky to win any of them! Nfu Oh 51 has been a long time lemming of mine, so I would LOVE to win prize #2! Ohmigoodness! I can't decide if #1 or #3 is best! You have such lovely gifts! I can't pick!! The purple polish from #1, all of prize 2 and 3....eeuuurrrgghhhh, ok, #2 because I don't have any Nfu-Oh yet! All the prizes are very cool, but you can never have too much nail polish! Gotta say #2 would be my fav. I'd really like to win number one! :) Rebecca Likes Cupcakes is super cute! ohhh I hope win!! Thanx!!! Oh my goodness! These are all so hard to choose from. I've been in love with Rebecca Likes Cupcakes since the first post you've shown of it. But I also love the Born Pretty Store prize. I've been lemming for the mood polish after I saw your post. I would love the giftcard. I would like prize number 2! I would love prize one, it has amazing polishes in it. Rebecca likes cupcakes is so cute! Also, I'd love Nicole by OPI. All the prizes are lovely, but I'd love number 1 — Rebecca Likes Cupcakes is amazing! I'd love the first prize, e love the polishes! All the prizes are great, but I think I like Prize #2 the best. Prize 2 - I don't think I own any Nfu-Oh's... and theyre PRETTY! I'm so excited for ALL of these! But definitely either your franken (I mean how cool is that?) or Nfu Oh 51!!! Prize one is what I like the most. So much cuter with the polishes. I would want prize 1! Those floam earrings are great. I would love prize 3, or prize 1, or prize 2, just surprize me! Omg.. Like them all for different reasons. Probably Nfu oh. Such a hard choice...I think I will say prize 3, but would be happy with any of them, they are great! I'd pick prize 1, I love the jewelry you make! Hmmm, tough choice but i'll have to go with prize 3. I'm drooling over the Nfu-Ohs! Thanks for the giveaway, I'd most like #3! Prize #1 please! I love hearts and am just ga-ga over everything offered there! Thank you for such a generous giveaway! Can't believe you are not making us DO something to be eligible--some kind of art.....hmmmmm.....Should I be lucky enough to win, I promise I will post a creative picture using whatever I have won! great prizes! 2 and 3 are making my heart beat faster though! Any of these prizes are awesome! I would love to have your polish you made! But, I love Nfu-oh, but already have #51, and I would love the giftcard, so any of them would be awesome!! Great giveaway! Thanks! Um, now I have to choose!? :) They are all marvelous prizes! Thank you for hosting this giveaway! But I think I would choose prize #3, the gift card! Thanks! I have been coveting nfu oh for a long time, so number 2! Prize 2? But Prize 1 is so darned cute!!! Well I love the grand prize (especially your polish) but I've been dying for some NFU OH (in particular #51)for so long, so I'd have to go with 2.
of course ANY prize would be awesome!!! I would like Rebecca Likes Cupcakes, though. the sticker on the front is so cute too! After seeing your stud nail art, I'm most excited for the Born Pretty certificate. Thank you girl! I guess... I'd have to say my favorite is the Nfu-Oh polishes, since I've had my eye on quite a few of their colors for some time now, and those two are just fabulous! Not that I'd throw a fit about the other prizes, of course! I would love to add your Rebecca Loves Cupcakes to my collection!! Plus those Floam earrings are adorable! The nfu.oh polishes (I have 55 and 43...I went to order them and the darker blue and purple were out of stock :( ) and the earrings! I'd like to win the gift certificate... There are some nail art supplies I'd love to get! Im not sure if prize number one or two! I would love either your homemade prizes or the Born Pretty gift card! Thanks for your awesome giveaway! Or the Nfu Oh! It's so hard to choose, they're ALL great prizes! I want to win this giveaway!!! Specially the jewelry! i love it! I've been lemming your Cupcakes polish since the first time I saw a swatch of it! OMG I love prize 2!!! I'd definitely want to win prize one just for your franken! i love prize 1! and prize 2. and prize 3. they are great items! I want prize 1 cause cupcakes(besides polish) are my Favorite things!! either prize one or two just can't decide. I'd love to win Nfu-Oh polishes, Prize 2..
OMG i would lvoe the Nuf oH polishes! i cannot get them where i live so to have a couple ohhlala!!! I'd love to win prize Nr.1! But I'm in love with your ring! I'd be happy with any of them, I cannot possibly decide between #1 and #3!! I think I would like to win the gift card. Great Giveaway by the way.. Good luck Ladies.. Thanks for this awesome giveaway!! ^_^ I really like all prizes...mmmm...Probably I'd choose #1. Suerte chicas!! I'd pick the prize pack number one:). Of course I want the "Rebecca Likes Cupcakes, Nicole by OPI Love Your Life, Nail Art Diva From The Heart 1 Plate, & nail polish jewelery from yours truly!"